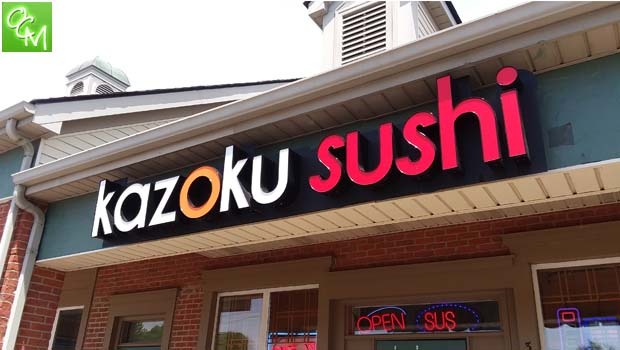 Kazoku Sushi Troy review, pics, hours, and menu info – Kazoku Sushi is located on Square Lake Rd in Troy MI at Livernois. Kazoku Sushi opened around August 2017. It’s a cozy restaurant with a sushi bar and a very friendly staff. The Kazoku Sushi menu is full of sushi options, bento boxes, Japanese entrees and Korean entrees. They also have great lunch specials Monday through Saturday from 11:30a-3p. You can order roll combinations with Miso soup for a great price. When seated, we were served a small cucumber salad with vinegar dressing. It was super fresh with crisp cucumber slices and a light vinegar dressing that was definitely not too strong. Our party ordered a couple Roll Combination lunch specials, a Chicken Katsu Japanese entree, and some individual sushi rolls. The Chicken Katsu was really good. The sushi was fresh and beautifully prepared. I ordered a Shrimp California Roll, a Dynamite Roll (salmon mixed with dynamite sauce and avocado), and the Veggie Dream Roll (crab salad, lettuce, cucumber, avocado, asparagus, red cabbage, pickled radish, carrot, pickled gourd, spinach, spicy mayo, eel sauce, tempura flake). I could not pick a favorite, they were all good. The Veggie Dream roll was surprisingly good…I didn’t know what to expect with all that stuff in it. It was difficult to get into my mouth, but it tasted great! Some of the Special Rolls that I look forward to trying are the Volcano Roll – Deep-fried soft shell crab, crab salad, cucumber, avocado, lettuce and cooked shrimp with spicy sauce inside, topped with fish eggs; Kazoku Roll – Deep-fried shrimp and crab salad inside, whole roll baked, topped with salmon, spicy sauce and eel sauce; and so much more. One of the people in our party ordered a Coke and they brought her a can of Coke rather than a fountain drink. I know this is a huge plus for some big Coke fans! We also really appreciated that they had Gluten Free soy sauce on hand. My friend usually has to bring her own, and she forgot this time so she was ready to run to the store after placing her order, but no need!